Jesus said, “. . . do not worry about your life, what you will eat or what you will drink; nor about your body, what you will put on” (Matthew 6:25). Worry is an interesting and destructive word, with more definitions then I would have thought. Consider the definition and then consider what worry can do in the context of your relationship with God. 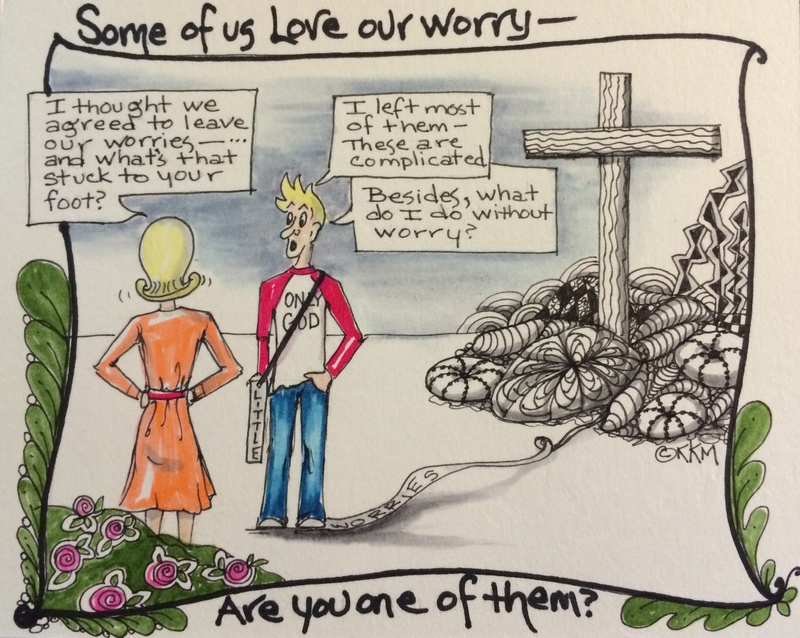 Why is it that we like to worry, tear at, choke, assail and nag at our relationship with God? For me, I think it’s because I’m a control freak, I have a plan for how things should turn out, I think I “know” all the in’s and out’s of the situation. I don’t trust God with the outcome–so I don’t want to give it up. Also, in my past, I’ve not known what to do when I didn’t have something to worry about. Turmoil was my norm–I’d been trained to live in it from my youth. As I’ve matured in my relationship with God I’ve begun to lose my addiction to anxiety/worry and learned to live with peace/unconcern. Amazingly, I’ve had to actually LEARN to enjoy peace and quiet. It’s an actual physical change as well as a mindset change–adrenalin is missing and the mind is no longer cluttered with, what if’s, how will’s, and when’s? There is now room for songs, laughter and joy. But like the parable of the clean room–when you allow God to clean out the worries, if you don’t replace it with something like songs, etc. the worries will just return with a vengeance. Oswald Chambers put it like this morning: “The greatest word of Jesus to His disciples is abandon.” Yep, I agree, but it’s the hardest thing to do!